Strike a Light is an exciting electronic reaction test game which has landed in the UK. It’s a game that all of us here at Altitude Events are incredibly excited about bringing to our events! Like Batak, Strike a Light is one of the most addictive games we have ever played, people just want to play and play! Strike a Light is a high paced 2 player electronic reaction test game. Strike a Light is THE perfect activity for Christmas Parties, Evening Events, Black Tie Dinners, Private Parties, School Fetes and just about anything else in between as well. Not only is Strike a Light a great game to play but it’s also a very entertaining game to watch meaning that it will also be a fantastic hire activity for Exhibition Stands at Trade Shows. No one will walk past without wanting to stop at your stand for a go! Strike-a-Light has 2 different game modes that can be played. The first game mode can be played by 1 or 2 players at a time and the aim is to simply turn off as many of the lights as you can in 30 seconds. The 2nd game mode available is a head to head battle mode between 2 players. Each player starts off with a set number of lights illuminated on their side of the game board and the players have to try and pass their lights over to their opponent as quickly as possible whilst their opponent counter attacks with their lights. The first player to get all the lights onto their opponent’s side of the game wins. Altitude Events are based in East Sussex and hire the Strike a Light reaction test game throughout West Sussex, Kent, Surrey, London, Hampshire, Berkshire, Buckinghamshire, Hertfordshire and Essex. All Strike a Light hire packages include a member of staff (CRB/DBS checked), a Top Gear style scoreboard, £10 million PLI and risk assessments. 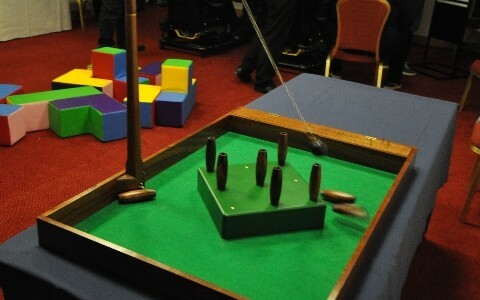 The Strike a Light game is built on its own stand and requires about 3m x 3m to operate in. Strike a Light rental is suitable for both adults and children (as long as they are tall enough to reach the buttons they can play). Strike a Light runs from a mains power supply and can be played both inside or outside (under cover of a mini marquee). We can use a battery if its an outdoor event with no mains power. All electrical equipment is PAT tested. Players must be tall enough to reach all buttons on the game table. If you can’t see the answer to your Strike-a-Light Hire question(s) below, please do not hesitate to contact us on mail@altitudeevents.org or on 0330 133 0900 / 07832 227 571. How many people can play Strike-a-Light? Strike-a-Light is a two player game, but can be played solo if required. Can anyone use the Strike-a-Light? Players must be able to reach all the buttons to play without leaning on the game table. Anyone deemed to be in an ‘unfit’ state to play due to the influence of alcohol or drugs may be refused on. Does Strike-a-Light have different game modes and options? Strike-a-Light has 2 different game modes. Can the Strike-a-Light be used outside? Yes it can but we will need to put it in a gazebo to protect it from the weather and also allow players to see the lights easier. It may also need to run from a battery if it was outside. Can the Strike-a-Light be used indoors? The Strike-a-Light is suitable for Indoor events, however we do not advise putting it in very bright areas as it becomes hard to see the lights. It requires 3m x 3m of space with 2m headroom. The unit is large and awkward to carry so please let us know whether there are long distances to carry it or any steps/stairs/lifts/doorways etc to navigate with the equipment as complicated set up routes may increase set up time or require additional staff which will increase the hire costs. Does the Strike-a-Light require a power supply? Yes, the Strike-a-Light requires one mains power socket or for outdoor events we can use a battery to power the game. Do I need to supply anything or does the Strike-a-Light come with everything it needs? How long does the Strike-a-Light take to set up? Depending on ease of access, the Strike-a-Light will take our staff approximately 15mins to set up. Does the Strike-a-Light come with someone to run the activity? How safe is the Strike-a-Light? How much does it cost to hire the Strike-a-Light? We will tailor make each Strike-a-Light hire quote to the specifics of an enquiry. The Strike-a-Light hire cost is dependent on factors such as your location, length of hire, date of hire and whether or not any other pieces of equipment are being hired for the same event, etc. Although we are based in the South East, we will travel anywhere to do an event. However, if it is very far from our base, the price will reflect this. Primarily our Strike-a-Light attends events held in East Sussex, West Sussex, Surrey, Kent, Essex, Berkshire, Hampshire, Hertfordshire, Buckinghamshire and London. Please contact us for further information if this is something that you would be interested in. Both myself and Rachel wanted to send you a quick message to say a huge thank you to you for being there and for providing the arcade games on our wedding day. We both had a fantastic day and the best way we can describe it is that we had the time of our lives! Everyone was pleasantly surprised to have a different entertainment element from the norm and expressed their delight at having alternatives to the dancefloor. We received a lot of positive feedback about how good it was to have the games there and they were totally amazing. We were both very pleased with our choices and our only regret is not playing them enough! We both wanted to express our personal gratitude to you and Mark for the effort that was put in on the day, thank you. Thank you all. Everyone commented on how much fun the Batak, Strike-A-Light and Buzzwire were so thank you for sticking with me whilst getting the booking sorted. Hope to work with you again soon!